Towards the end of 2014 the BBC published this article suggesting that 2014 was set to be the warmest year on record. It initiated the article identifying that the global average air temperatures for the first 10 months of the year had been 0.57 degrees Celsius above the average, whilst up until November in the UK we had produced an average temperature of 1.6 degrees Celsius above the long-term average. There was certainly a noticeable difference in the temperature throughout the Autumn months of 2014. Then by the end of the year, NOAA published their annual global climate analysis which confirmed that “the year 2014 was the warmest year across global land and ocean surfaces since records began in 1880”. This meant it broke the previous records of 2005 and 2010. It’s scary to see that the top 10 warmest years have been since 1998. The NOAA report makes for interesting reading, I recommend taking a look at it. Visit the National Geographic Education Blog for ideas on discussion activities on the topic. The NOAA education site from NOAA has resources on teaching about climate with a variety of resources and links on climate measurements and the global temperature record. At uni my passion was water resources; for my dissertation I investigated the sustainability of water resources for Ashford in Kent following the development of 32,000 new homes in an area that already had to seek alternatives due to water shortages. This story is really useful for GCSE Geography, particularly Edexcel B. My year 10’s have just finished Battle for the Biosphere and are now moving onto Water World. This story leads on to the next topic perfectly. In 2014, rainfall in São Paulo and the surrounding south-eastern area had been extremely low, with CEMADEN recording the lowest rainfall on record. The South Eastern region is the most populated area of Brazil, with over 20 million people living in São Paulo alone. The drought has been ongoing for some time but conditions are worsening and the impacts are being felt throughout the city and country. Brazil are looking to experts from overseas to help deal with the consequences of this drought but the issues are rapidly growing. Lots of interesting articles both on the cause and response to the issue. Drought in Brazil from Teachit Geography – A great fact sheet on the drought in Brazil published in march 2014. This could easily be given as background information for a decision making exercise on what the government should do to deal with the issue. Tutor2U has provided two videos explaining the drought in São Paulo. Here on the TES are a whole load of resources from my NQT that make up a SOW on Investigating Brazil, why not incorporate this issue in this topic. Sorry there are only two stories this term, time constraints and all that. Hope they are of use though. Categories: In the News, Resources | Tags: Brazil, Climate, GCSE, KS3, Resources | Permalink. One of my favourite topics has to be Weather and Climate. I find it fascinating and really want the pupils to see how much there is to discover about our weather and climate. I’ve become rather stuck at writing the Scheme of Work for this topic however, there’s too much I want to cover. Do I keep it to the processes and daily influence of weather? Do we look at global climates? Do we delve into the impacts of extreme weather? Should we approach climate change? Ahhh so many ideas, but only 7 weeks to cover the topic. I’ve tried to throw in a bit of everything. Once complete I will share the SOW with you, until then I will leave you with my Rainfall Spinner. The idea of the Rainfall Spinner is to understand the 3 types of rainfall; relief, convectional and frontal. Firstly give an overview of the 3 rainfall types, in order to this I will be sharing this video with my HA students and this video with my LA. I will expect them to take notes as they watch the video, the LA pupils will be given a table with the 3 types and they will then be expected to write down the appropriate details. Below you will find the PowerPoint I will use to bring the tasks together but I have removed images so you may want to add some of your own. The main part of the lesson will involve the pupils creating a Rainfall Spinner like the one below (hopefully theirs will be prettier than mine). To differentiate HA will be writing their own descriptions based on their understanding, MA will be completing the descriptions by inserting the missing words whilst the LA will be matching the descriptions to the diagram. 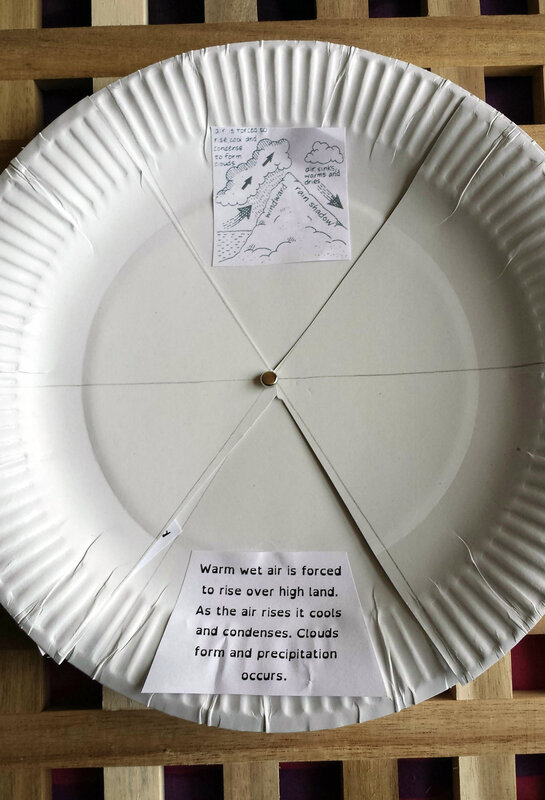 As the pupils then spin the top wheel it will display information about each type of rainfall alongside a diagram (if they complete it correctly). I’m really excited about this idea and really hope the pupils are engaged by it, I will post pictures of the pupils work once we enjoy the lesson next term. To make your own click on the image below to download the instructions, descriptions in full and the descriptions for fill in the blanks. Since I do not own the copyright of the images I used, I’m afraid these have not been included but you can find them here. I am happy for you to use and enjoy my resources, but please leave feedback. I like to know how they go so I can improve them further. Categories: Resources | Tags: Active Learning, Climate, Geography, KS3, rainfall, Weather | Permalink. 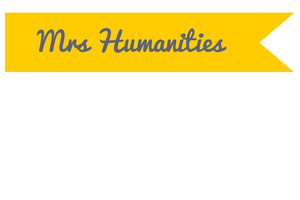 Whilst I am a Humanities teacher, my passion lies in Physical Geography. One topic I get enthused by is Weather and Climate. In the UK we regularly experience the passage of a depression. Those pesky low pressure systems can often create havoc such as the Winter storms of 2013/2014. The first storm arrived on December 5th 2013 and with it came strong winds and a storm surge. The consequences included 100,000 homes without power, flooding, grounded flights, traffic accidents and even a few fatalities and they were far spread from North Wales to Norfolk, Scotland to Kent. The impacts were felt across the country. Despite the disasters it creates some fantastic teaching opportunities when the pupils see it happening there and then. One of my favourite resources is a Passage of a Depression thinking task. It encourages pupils to think logically and to recognise patterns in order to arrange the cards correctly. The task can be differentiated by adding information or removing information from the diagram, cards or table. I’ve used it numerous times with both Key Stage 3 and 4 and both as part of a lesson on depressions and as a revision tool at the end of a topic. To use the activity pupils will need a copy of the diagram and table sheet as well as a set of cards. Pupils can work independently, in pairs or small groups to complete the challenge of this task. After having taught pupils about the passage of a depression, pupils interpret the diagram to sort the cards into the table to outline the weather, temperature and cloud types associated with each part of the depression as it moves over a location. It can be followed up with a living graph such as this one to assess pupils understanding. How do you approach teaching weather fronts and depressions? Share your ideas in the comments below. Categories: Resources | Tags: Climate, Weather | Permalink.